Factoid #16. 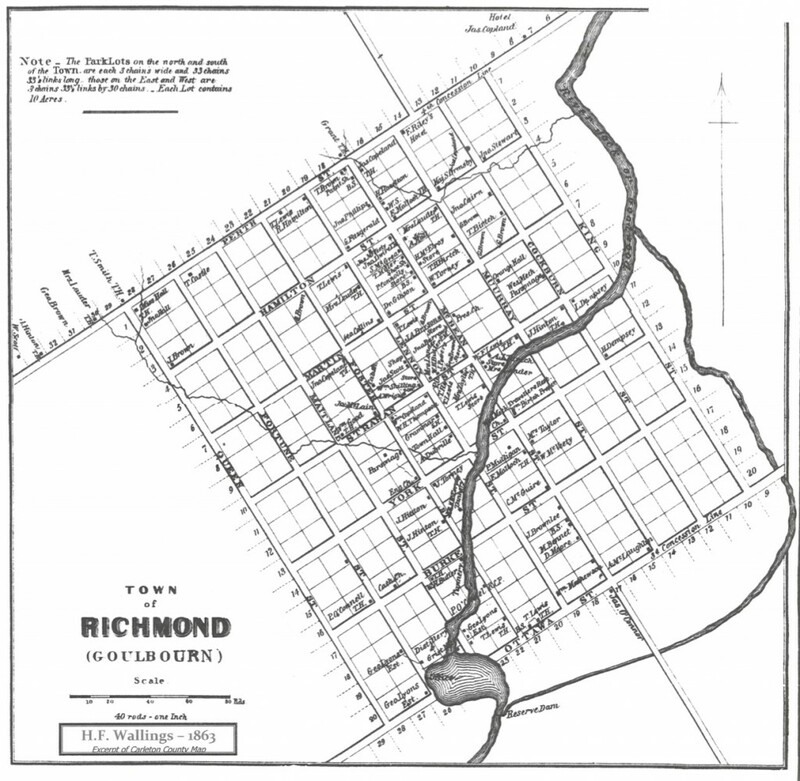 The forests around Richmond teemed with game and the Jock and its streams had no shortage of fish so the acquisition of animals as a food source was not as urgent as the planting of seeds. The settlers did need animals to facilitate transportation and heavy work. Oxen were preferred because of their ability to pull heavy weights and they were more sure-footed than some horses. Later when roads were less treacherous and the settlers were more prosperous they acquired horses. Accounts say the first and at the time only large animal in the village belonged to Sergeant Andrew Hill. Not having been able to harvest hay in the summer of 1818, the Sergeant walked to Merrickville to get food for his oxen (or cow depending on the account) the first winter. The military officers certainly anticipated that they would soon be getting stock for their own needs. In an as yet unpublished article by George Neville, Col. Burke is quoted as describing how sheds for livestock were built behind the administration building in 1818. “I have also erected on the premises a Horse Stable, Cow Stable, Calf House, Sheep House, Three Pig houses, a Dairy and other offices.” There is no mention of these buildings having occupants but they would be well housed when they arrived! Factoid # 17. There is some confusion about the ranks held by various officers who settled in the village. It is normal to show respect for military leaders by referring to the highest position that they held during their lifetimes. In most instances the officers in the village were members of the Carleton Militia, which was started in 1821. The following men were members of the 3rd Regiment. George T. Burke was the Colonel of this Regiment from 1822 and although he was a major when he sold his regular army commission, he is normally referred to as Colonel. In a few instances he is called Major if a writer is referring only to events that occurred before 1822. In fact his case is special as he had the title Brevet-Major. Although I’m not an expert on military matters, I believe the term Brevet was an honorary title placed in front of a rank because the person had performed an outstanding or courageous act. Burke certainly fit that description. Men of other ranks also benefited from militia membership. For example, Captain Andrews Lett became Major Lett and Lieutenant George Lyon became Captain Lyon. Andrew Hill was a sergeant in the regular forces but one sees him also referred to as Sergeant Major Hill. Both are titles of non-commissioned officers. When he joined the militia he was given a commission as ensign. This was the lowest ranking officer and by tradition this would have been the officer responsible for protecting the colours or flags. Some writers refer to him as Colour Sergeant Hill but I have not seen a writer refer to him as Ensign Hill. Titles do indeed get a little confusing. Factoid #18. Capt. George Lyon of the 100th Regiment dominated all aspects of the development of Richmond from the time he came to the village in 1818 until his death in 1851. He had a special bond with the soldier/settlers having fought on the battlefield with them (he was wounded at the Battle of Chippawa) and seems to have tried to help the veterans and their widows. They in turn supported his various endeavours. Under the military administration he acted as Pension Agent but at the same time he was establishing commercial and industrial infrastructures. As early as 1819, he was running a store and making preparations to build a sawmill. In the 1820’s as farmers produced grains, Lyon built a gristmill and distillery. A little later he added a carding mill. He was rewarded handsomely for his endeavours and over time received thousands of acres of land from the government. Lyon was heavily involved in the political scene in the 1830s. He represented the area in the Legislative Assembly of Upper Canada. He was the postmaster and he became a magistrate. In the early 1820s this Scotsmen joined Presbyterian petitioners asking for land for a church. Later he supported the Anglican Church, was a churchwarden, and is buried in the Anglican cemetery. George Lyon’s influence lasted long after his material empire had decayed. His children impacted not only village life but also the development of the City of Ottawa. Future factoids will address the many facets of Lyon’s influence. See also the 4 posts on this site by James McTavish, a descendant of George Lyon. Factoid #19 Did you ever wonder where, in 1820, a businessman would get his stock and how he would get it to the village? Although Richmond had several merchants, the only known record of transactions is an invoice book belonging to George Lyon. It shows the articles he bought in Montreal from 1821 to 1829. Lyon spent on average about £1000 per year and purchased from 14 different suppliers. About once every 2 months either Lyon or his agent visited the importers and chose goods for the store. At times the buyer even roamed the docks looking for good deals as ships were unloading. 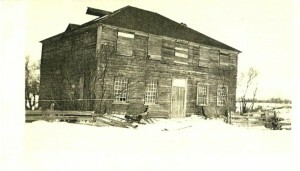 In the early years, Lyon stocked items essential to establishing a farm or business. As well as seeds and axes, nails and hinges were the most common goods. He also bought grocery items: tea, Jamaica spirits (rum), molasses, sugar, tobacco, soap, salt, candles, leather and shoes, and paper products. In Oct. 1821 Lyon even purchased items used in building a mill (from St. Mary Foundry). Fifty percent of his purchases were dry goods: blankets, hose and stockings, rugs, rope, gloves, and bolts and bolts of fabric as well as pins, needles and thread. A Durham Boat could be sailed, poled or oared. 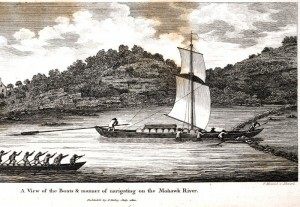 delivered in summer, Durham Boat or Bateaux carried it to Hawkesbury. There it was portaged around the rapids, reloaded and transported to the foot of the Chaudiere Falls. The barrels and casks were then carried overland to the village. April and August were the least favourite times of delivery. The first because of the spring floods and the second possibly because of the harvest. There is almost no indication of loss or breakage so the system seems to have worked well. Note the flooded area and King’s Creek to the east. At one time there were 2 dams on the Jock River. In fact one hundred and fifty years after their construction, residents still talked of the “drowned” land when referring to the area flooded by the dams. Before George Lyon even arrived in the village, Col. Burke had given him several lots straddling the Jock north of Ottawa Street, as this was deemed the best area to build a dam and mills. By 1821 Lyon had built his sawmill on the west side of the dam. In 1825 he added a gristmill and soon after a distillery for making whiskey. He built a second dam at the top of the Rock Cut (just east of the present Legion building). At this location Lyon built a carding mill. The exact date of its construction is unknown, but it would not have been until the local farmers had enough sheep to provide the wool needed to make it a viable business. This entry was posted in agriculture, Locations, merchandise, military, Personalities. Bookmark the permalink.